OCCAM hosted two Cancer Research Training Award fellows in the summer of 2010, each with distinct skill sets and personalities, and each of whom contributed to the science of CAM in very different ways. Jeans Santana, a recent 2010 graduate from Boston College with a degree in Sociology and a concentration in PreMed worked with Drs. Farah Zia and Oluwadamilola Olaku in the Case Review and Intramural Science Program (CRISP) . Jeans’ personal research, along with working closely on case reviews for the CRISP program, focused on Hispanics and CAM use. Yichao Mark graduated from Boston University with a B.S. in Biology in 2010. He worked in Dr. Francesco Mariconla’s laboratory in the Department of Transfusion Medicine on research related to PHY906, a herbal Chinese medicine preparation used in cancer treatment. 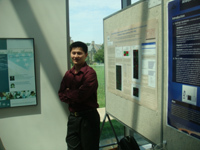 Each presented at the NIH Summer Research Program Poster Day on August 5, 2010 at the Natcher Conference Center on the main NIH campus in Bethesda, MD. 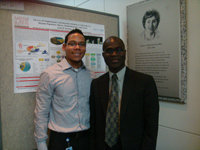 Mr. Santana’s poster was titled: “The Use of Complementary and Alternative Medicine (CAM) in the U.S. Hispanic Population: History, Health Disparities and Cancer.” The objective of this research was to summarize current literature on the use of CAM for the management of cancer within the Hispanic population in the US and how it is related to health disparities. Mr. Mark presented on microRNA profiling of colorectal tumor tissues from rats treated with PHY906 in conjunction with CPT11 (Irinotecan, a chemotheraputic agent). Each of these posters attracted significant attention from the viewers and provided the fellows with valuable career experience. For more information about the research presented in this article please contact OCCAM at ncioccam1-r@mail.nih.gov. A new analysis of data from the Ginkgo Evaluation of Memory (GEM) study suggests that the herbal dietary supplement Ginkgo biloba does not reduce the risk of most cancer types in older adults. 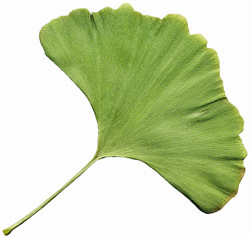 Previous research suggested ginkgo might have anti-cancer properties, and this study investigated that possibility in the largest randomized, placebo-controlled trial of ginkgo to date. The findings were published in the journal Pharmacoepidemiology and Drug Safety. The parent study, supported in part by NCCIH, involved 3,069 participants at least 75 years old who were randomly assigned to take 120 mg of a carefully standardized ginkgo product or a placebo twice daily for 6 years. Using hospital admission and discharge records, the researchers observed 310 cancer hospitalizations among the participants—148 in the placebo group and 162 in the ginkgo group. The rate of cancer overall was similar between the two groups; however, compared with the placebo group, breast and colon cancers were increased among participants receiving ginkgo, while prostate cancer was reduced. Although these results were statistically significant, the researchers noted that the study's small number of cancer cases should be taken into account when interpreting their findings for ginkgo and specific kinds of cancer. In addition, the scientists also point out that their research does not rule out the possibility that use of ginkgo starting at a younger age, or with a longer follow-up period might decrease cancer occurrence. Previous results of the GEM study showed that ginkgo had no effect on dementia and that it did not prevent heart attack, stroke, or death, but may reduce the risk of developing peripheral arterial disease. Biggs ML, Sorkin BC, Nahin RL, et al. Ginkgo biloba and risk of cancer: secondary analysis of the Ginkgo Evaluation of Memory (GEM) Study. Pharmacoepidemiology and Drug Safety. 2010;19(7):694–698. The link between vitamin D and cancer risk remains a priority topic of research. Researchers are working to address the unanswered questions that surround this connection. 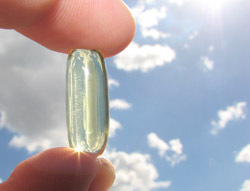 People primarily generate the vitamin D3 hormone (the biologically-active form) when their skin is exposed to ultraviolet B radiation from the sun, explained Candace S. Johnson, Ph.D., deputy director and the Wallace Family Chair in Translational Research at the Roswell Park Cancer Institute in Buffalo, New York. Dietary vitamin D – found in eggs, fish and fortified dairy and cereal products – is usually inadequate, so that people who live further from the equator or spend less time outdoors have higher rates of vitamin D deficiency, she added. Dr. Johnson and her colleague Roswell Park CEO Donald “Skip” Trump, M.D., have been pioneering ways to explore the vitamin D link to cancer risk, particularly in prostate cancer. In an earlier phase II trial*, more than 30 percent of men had their prostate-specific antigen (PSA) levels reduced by at least half, after taking a form of vitamin D (1,25 dihydroxycholecalciferol) known as calcitriol. The vitamin D compound was given along with dexamethosone (one of the synthetic hormones known as glucocorticoids), which appeared to improve the impact of the drug. This impact may be due to increasing the amount of vitamin D receptor (VDR) that is expressed on most of the body’s cells, including cancer cells. In her current NCI-funded research**, Dr. Johnson and her colleagues are looking at men previously diagnosed with castration-resistant prostate cancer whose disease has usually spread (metastasized) and is growing without restraint. “Many of them have persistent bone pain and are feeling pretty lousy,” she noted. Most of these patients were originally treated with radiation or surgery, and now hormonal therapy is no longer effective. “Many of the men in our earlier trial felt better and had less bone pain after treatment with combination of calcitriol and dexamethosone,” explained Dr. Johnson. “We need to know more about what is happening at the molecular level, so that we can determine how much calcitriol we can give safely and the best way to administer it.” In some people, it turns out that blood levels of vitamin D do not simply rise when you give higher doses of calcitriol. “I think that the dosing schedule may be a crucial part of the vitamin D puzzle,” she said. Early results suggest the best strategy might be to give very large doses for one or a few days, followed by 4 or more days off. But a larger problem is keeping cancer patients from developing hypercalcemia, Dr. Johnson cautioned. This condition arises when the calcium blood levels get too high and can sometimes lead to digestive and kidney problems; muscle and bone pain; and even psychological issues such as apathy, irritability, and depression. Dexamethasone may decrease calcium absorption by reducing the amount of VDR in the intestinal mucosa, where calcium enters the bloodstream, while at the same time increasing VDR in the tumor, she explained. So far, the greater amount of calcitriol that’s given, the greater the impact on the cancer and its symptoms, Dr. Johnson added. However, within minutes of calcitriol entering the bloodstream, the cyp24 gene is activated and starts a process that breaks down calcitriol. Dr. Johnson and her colleagues are now looking to add a third drug, ketoconazole, to the combination, with the idea that ketoconazole will turn off induction of cyp24 and thereby increase the amount of calcitriol actually getting to the prostate tumors. “We’re looking at the whole sequence of events from every angle,” Dr. Johnson said. If their current phase II trial provides good information about dosing and effectiveness of calcitrol in combination with the two drugs, it may eventually lead to another treatment option in prostate and other solid tumors, she added. * Trump DL, Potter DM, Muindi J, Brufsky A, Johnson CS. Phase II trial of high-dose, intermittent calcitriol (1,25 dihydroxyvitamin D3) and dexamethasone in androgen-independent prostate cancer. Cancer, May 15, 2006;106(10):2136-42.